Merry Christmas & Happy New Year to the SPCA! 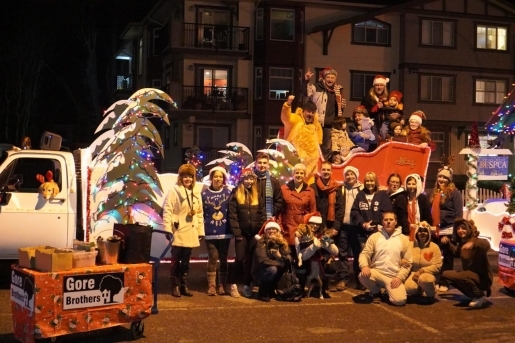 SPCA and Gore Brothers teamed up and placed a float in the 2018 Chilliwack Christmas Parade, to promote the protection of animals from abuse and neglect, winning the People's Choice award! In honor of being voted the best of the best, The Chilliwack Parade Committee donated $500 to the Chilliwack SPCA. Everyone please do your part by spaying and neutering your pets. Let's be responsible pet owners and choose sterilization over euthanization, and put a stop to the ongoing abandonment of animals. One small sterilization for your pet, one giant leap for animal rights! Gore Brothers have released their first set of home plans. 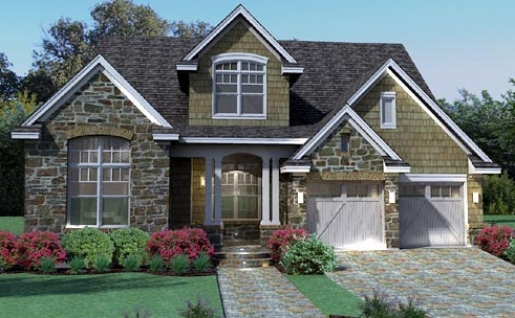 Pick your river lot and house plan. Gore Brothers homes are built to the highest standard of excellence with superior finishing and craftsmanship. Imagine living the dream with serenity, fulfillment and happiness. Recreate harmony in your life and become one with nature. 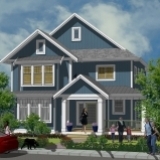 Purchase now at pre-construction pricing. Mark and Tony Gore have been featured on an episode of Hoarding: Buried Alive, where they restore the home of a woman in-need. 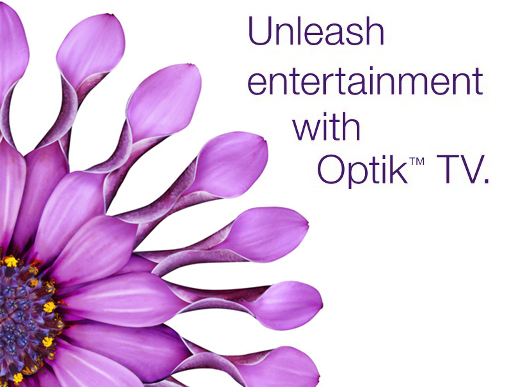 TELUS and Gore Brothers are excited to offer you a FREE year of revolutionary Optik services. 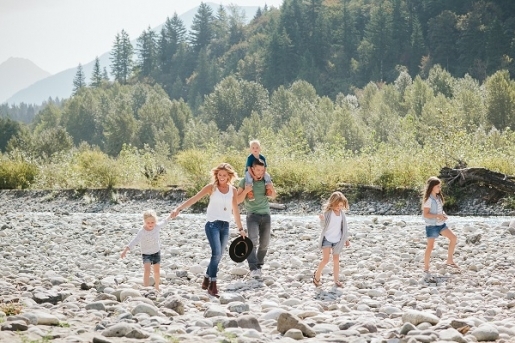 The hidden jewel of Chilliwack is being discovered by Metro Vancouverites. 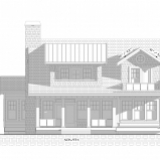 The Gore Brothers are honored by the multiple requests from returning and new customers to build luxury custom homes. We are currently busy with our present project at River's Edge, and unfortunately are unable to custom build homes outside of this development at this time. Please contact Jill Hall for more information. Happy 150th Canada Day Gore Brothers! 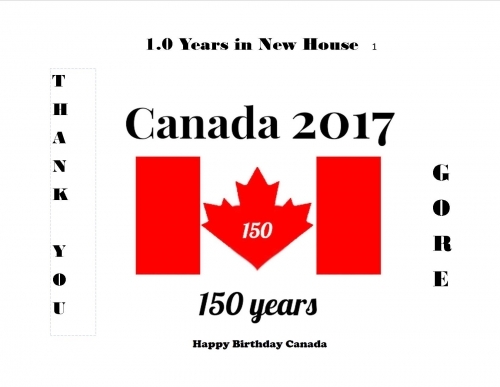 I looked all over for a card in Chilliwack re 1 Year Anniversary of Home and one of 150 years for Canada's Birthday and nothing.. .So I had no choice but to attempt to make one. So here is that attempt but in all sincerity I am very thankful we got this house and I remember it was last year on Canada Day Long Weekend Dano and I were moving our stuff in. So in that year all the staff at Gore have been super super patient and very helpful in all our issues etc as many of them of our issues were just not knowing how modern stuff worked.. So I so mean not to leave anyone out but almost in order i met people Thank You to Crystal, Jessica, Lee, Jill, Jeff, Kevin, Nat, and Tony. I do not believe I have met Mark yet, but think I may have seen him with Jill at the Rivers Edge Dedication last weekend.. Thanks for never ever being rude and being there for us all the time. Business Excellence Awards 2014 "Development Excellence Award" - Residential and Commercial – Presented to a development of superior design and engineering.Who have enhanced the existing neighborhood, be of the utmost quality construction and finishing and provide long term value to its occupants. The residential or commercial development will bring additional jobs, commerce and economic growth to our community. This development will also give strong attention to the development of local roads, infrastructure and neighborhoods, architectural design and ground breaking engineering. Experience a Gore Brothers home from the comfort of your computer. We are proud to provide a dynamic, interactive virtual tour experience of our developments through our interactive map section. Please check out our map section and enjoy your tour. The accolades and astounding demand for the Gore Brothers Homes has delighted Mark, Lee and Tony Gore, three locally-born craftsmen, who have formerly led British Columbia's largest renovation from the beginning. "The military base is a special presence and we are honoured to have been chosen to refurbish the permament married quarters and preserve an important piece of Chilliwack's history" said Mark Gore, president of Gore Brothers Homes, who, along with brothers Lee and Tony, are fourth generation Chilliwack residents. 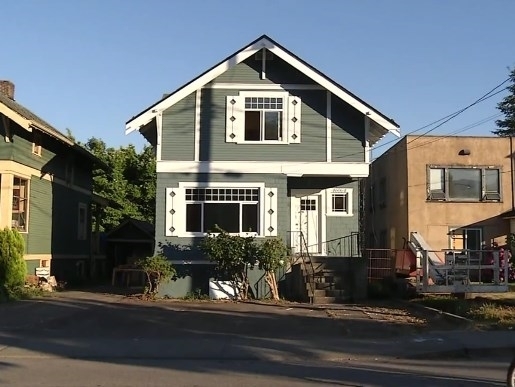 The Gore Brothers, master renovators and new home builders, were selected by Canada Lands to refurbish the vintage housing as part of its masterfully planned Garrison Crossing redevelopment of the former military base. Gore Brothers have now completed the largest residential refurbishing project in British Columbia and are now building new homes at the new development of Lindys Crossing. The Gore Brothers are excited to be able to continue to build homes for new and existing Chilliwack residents. Gore Brothers have a dedicated following of Home owners who recommend the Gore Brothers homes to their family and friends. "I have bought a few homes over the years but must say buying a Gore Brothers home was one of the most pleasant experiences of purchasing a home by far. Realtor Jill Hall is extremely knowledgeable and helpful through out the process, from writing the offer to moving in. She went above and beyond to make the purchase of my new home stress-less. The rest of the team were also as helpful and friendly. It is a family atmosphere and I feel I was treated with the utmost of respect and consideration.
" I am not looking to by a home, but I just saw the hoarders episode and I just wanted you to know how what you did was so special and it really touched my heart to see such a selfless act, you don't see things like this everyday, I know you said it was a bit if a bidding war but I think God knew what he was doing when he brought that house to you, you are both angels on earth! "The Gore Brothers and Jill Hall have made the purchase of our new townhome in River's Edge such an enjoyable experience. We were searching for a Gore Brothers home and feel so lucky to have found one in the most serene location. We love that their homes are unique, spacious and inviting. The interiors and exteriors are beautifully designed with a mix of styles and colours. There's just something different and special about walking into a home built by the Gore Brothers. Jill is wonderful to work with. She is informative, organized, professional and extremely kind. We felt she was happy to be a part of our home selling and buying journey. Anything we have needed or had questions about has been dealt with quickly and professionally by Jill and the team. "Gore Brothers have been exceptional since the start of the building of our new home. Whether it was being open to answering questions throughout the process, to the very first day in our new home, when we arrived to presents and a walk through with Jeff showing us all the tips and tricks of our new home. Gore Brothers is second to none with finishes, design plans and, most importantly, the care they take with their clients.
" Gore Brothers Homes, you probably never expect to receive positive emails very often, but here is one. I was very pleased to talk with both you and the site supervisor today on behalf of my son's home. You both were very relaxed and professional and I left the office feeling so much more relaxed and in the know. Thank you both very much for listening and for your patience. 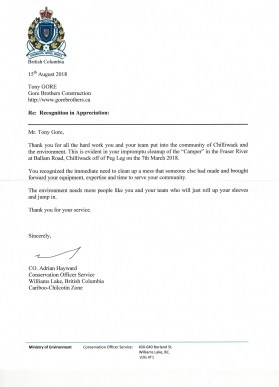 "Thank you so much for your prompt response to our problem. Everyone in your company is so pleasant and helpful, making this community so special. Thanks so much for your time and attention. "Jay and I would like to thank for your help with both our clients at The Current. They are absolutely over the moon with their new places. In particular I'd like to comment on the inspection and move-in procedure- your team from Gore Brothers did an outstanding job making this sometimes scary event an absolute pleasure. Every detail taken car of and the welcome flowers, umbrellas, pizza certificates, and house binder were very well received. Again you people at Gore continue to surprise me with your attentiveness and willingness to go that extra mile for your customers. This is something that truly surprises me and is as wonderful as the sunshine peaking out after days of gloomy clouds. Something that makes me smile from the heart instead of the face. 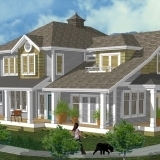 "The purchase and the construction of our new townhouse by Gore at the Brigadoon development has been one of the nicest experiences that we have had. Being from out of province we anticipated lots of challenges and were concerned on how we would get it all done. The Gore team were absolutely efficient and accommodating to all our requests and needs. Jill was a pleasure to work with, she was genuinely concerned and helped us with many decisions. 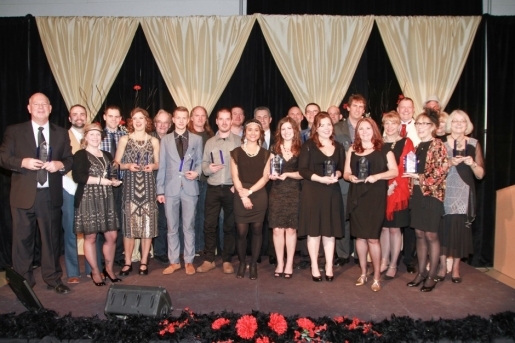 The whole Gore team can be described as professional, accommodating and genuinely excited about the work they do. The quality of the workmanship and building materials is second to none providing us with real value for our money. My son a Civil Engineer made many trips through the area and was very impressed with the structural quality of the building in materials and workmanship from the foundation up. Simply a trouble free move and a great start in a new home. "We purchased our vintage house in Garrison Crossing five years ago. We had looked at the overall development and been struck by the Ontario village likeness both in the house designs, and the urban living concept, which included shopping and pleasant tree lined boulevards. The real estate gurus said it was a good place to invest in and our property values seem to corroborate that. 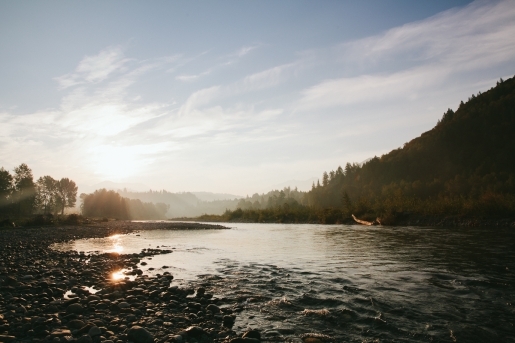 It is close to natural amenities such as Cultus Lake and the Rotary Trail by the Vedder. We are pleased with our house which has character and none of the drawbacks normally associated with that asset. The quality of refurbishment has proved to be very good. Gore Bros. (the builder/developers) were professional and accommodating. This extended to repairing a broken trellis a few months ago which we had not requested and was completely at their own instigation. We will not hesitate to re-list with Jill Hall when it comes to resell and are pleased to offer this recommendation of the entire Gore Bros. team. 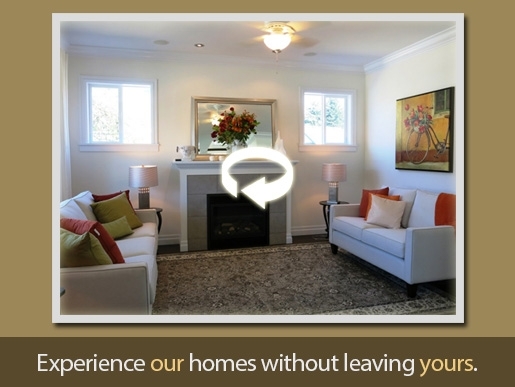 "While looking for a townhome in Garrison Crossing, by chance I visited Gore Brothers’ show home. Matt invited me to take a look at one of Gore Brothers’ projects across the street, and I was immediately drawn to the ambience of the heritage style building. In addition there was a separate carriage home on top of the large garage behind the main building. The mature red maple trees added to the heritage style of the project – although it was in the middle of the construction process, and far from what I had set out to look for, I decided to make an offer. When the time came to choose the interior, set schemes were offered, but I was allowed to mix and match individual elements, which turned out to create the exact interior I wanted. The home was finished on time with meticulous craftsmanship. On behalf of myself and family, we sincerely convey our appreciation for making the relocation to our new renovated home a very smooth transition. The sale of our townhome and possession date would be done before our Gore Brothers home would be completed, happily the whole Gore team stepped up to the plate, went into overdrive and finished the renovations quicker than originally planned. The day before the possession of the Gore Brothers renovated home, a full walk-through top to bottom, inside and outside was done by myself and spouse. What was noticed was a high standard of quality of construction and attention to finishing detail throughout. Walking through the house only a few minor discrepancies were found, sticky door, touch up on paint in a couple of areas, and one door lock that needed adjusting! All of these issues were taken care of and completed as Promised either the same day or within a couple of days. "Living at Garrison Crossing was a must from our very first viewing of it. While looking for a property out here, we made what seemed to be, a wrong turn but, as life sometime shows, it was the perfect move. I fell in love at first sight with the charm of the neighbourhood. It was a rainy November day last year but I had to get out of the warm vehicle and walk the area! 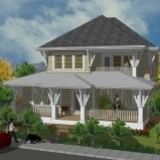 I was just blown away at the vision of the developers, unknown to me to be ‘Gore Bro.’, all the beautiful tall trees, the style and quaint charm of the houses. Not a cookie cutter look but with a continuity that plays off one another’s charm. Fabulous! It gave me a feeling of going back in time to a place when life was always ideal. Now walking our dog, I still get that feeling and I just love it. So...we picked out a lot and I got my sweet yellow house with its big sunny porch, picket fence and all. 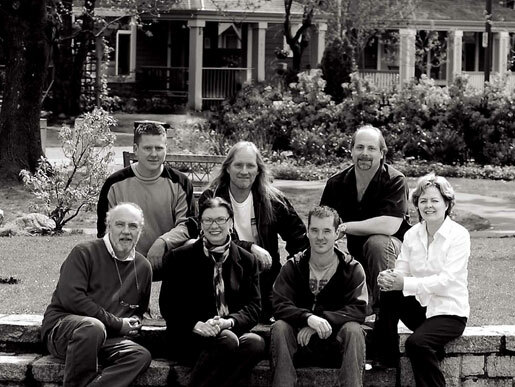 Jill Hall and her family ‘Gore Bro. Developers’ have made the process pleasant. They where helpful with a few of the interior design changes I wanted and their co-operation since then has been wonderful. The quality of workmanship is second to none, any problems that have arisen , which have been few, for instance shingles blown loose in the wind, have been taken care of promptly. 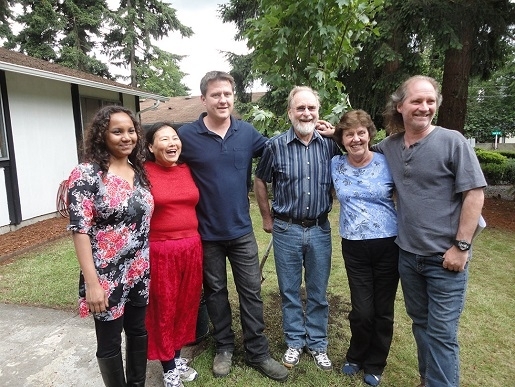 "We were out for a drive one day in August 2010 and ended up in Chilliwack. We were both born in Vancouver and were in the market to buy, but I had zero interest in living out this way. I was interested only in North Vancouver or White Rock. On our return home we came upon Garrison Crossing quite by chance. We drove in and loved it at first sight. The character, the charm, the trees, the fantastic vibe. We loved the vintage style of the refurbished homes and the other homes were lovely as well. We immediately fell in love with the show home, where we met Jill Hall. I told my husband that I was willing to live in Chilliwack but it had to be here in Garrison Crossing. The house we bought was not to be ready for possession until December 10th. We spent many afternoons driving out to visit our home and check it's progress. We were always loathing to leave the area and couldn't wait to be actual residents. We spent a lot of time walking the neighbourhood prior to moving in and found other residents we encountered to be exceptionally friendly. It's like a little world unto itself...a step back in time. "Just saw your episode on Hoarders. You guys are heroes. Just shared your story on FB and thank you for taking care of those in need!!!! "I don't need a house or to sell a house. I just watched the hoarding episode and have to say it brought me to tears. Your generosity and kindness is hard to find in this world today. May God bless you richly for your good hearts! incredible human beings for what they did for this woman. God bless them, God bless their families and their business. What they did is an example of what Jesus told us to do: love, love, love and show love to people. "Thank you so much.... we are excited! Can’t wait to head out to our new place tomorrow morning! We really appreciated the bag of goodies that were left for us... great items that we will be using! I’m still enjoying the beautiful bouquet of flowers! I think we will save the pizza order for our move in day! Also thanks so much for the home service gift... we chose Shaw and Jim has already been in touch with them for our installation ....what a great gift! Many thanks to you (Jill) and your Gore Brothers. 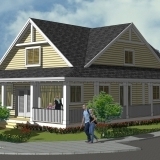 We love the house and look forward to getting settled in Rivers Edge! Hope to see you in the neighbourhood! Stop by anytime!